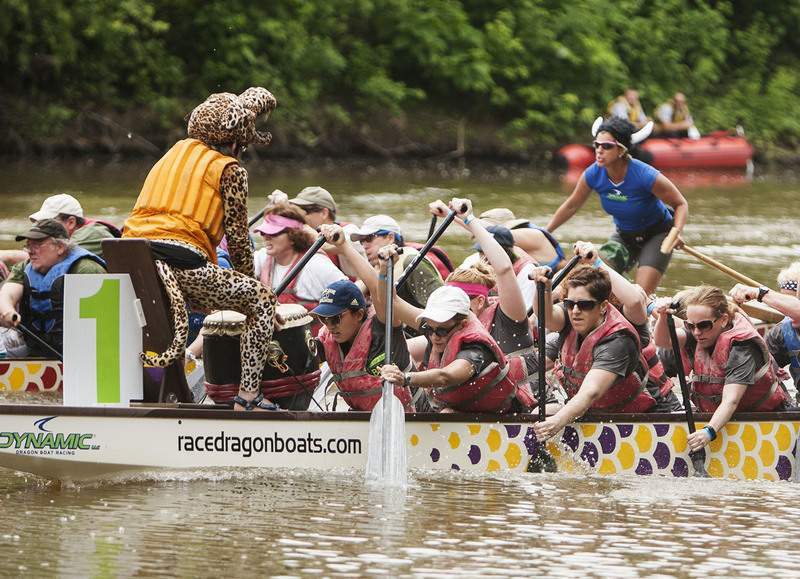 Photos by Chad Ryan | The Journal Gazette Dressed in a cheetah suit, Candis Allwein hits the drum to keep Team Parkview Blew Bayou on pace during a heat in the Riverpalooza dragon boat races. Bayou went on to win the nonprofit division. Road Warriors, a crew of workers from Fort Wayne’s public works department, rows toward the finish line in the city division championship. The team lost to the Fort Wayne Fire Department. 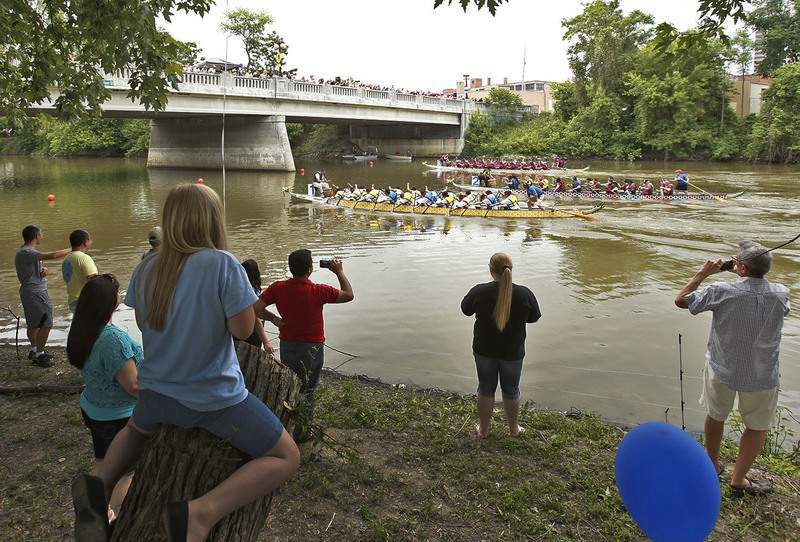 Chad Ryan | The Journal Gazette Spectators take photos and cheer Saturday as crews in one heat in the Riverpalooza dragon boat races approach the finish at the Harrison Street bridge. Cheers, chants and laughter filled the air Saturday throughout Headwaters Park West, mingling with the rhythmic beating of drums as teams of paddlers in boats shaped like Chinese dragons navigated the St. Marys River. "It’s my first year back in the (northeast Indiana) region, and it’s events like this that make me glad that I came back," said Ryne Krock, who was rowing with the Northeast Indiana Regional Partnership team. In all, more than 500 people – racers and spectators alike – attended Saturday’s celebration. 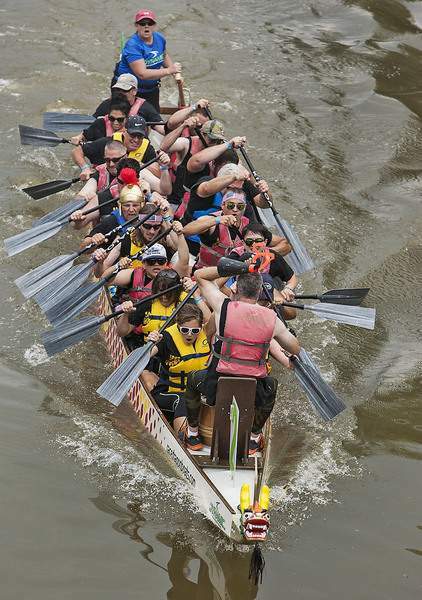 Twenty-five teams took part in Fort Wayne’s first-ever dragon boat races, representing such organizations as the Northeast Indiana Partnership, Cancer Services of Northeast Indiana, Steel Dynamics, Parkview and various city departments. Saturday’s races were part of Riverpalooza, a first-time community event that included face painting, airbrush tattoos, food trucks and live music. According to the Riverpalooza website, dragon boat racing goes back 2,000 years to the Chinese tale of Qu Yuan, a statesman who committed ritual suicide. In that story, local fishermen used their boats in a futile attempt to save Qu Yuan, who was drowning in the Miluo River. Modern dragon boat races seek to recreate the fishermen’s mad dash to save Qu Yuan. The event’s Chinese heritage was celebrated Friday night at an opening ceremony that included authentic Chinese dress, as well as dancing and singing by the Fort Wayne Chinese Friends and Family Association. "The Chinese groups here in Fort Wayne were so excited," said Karen Richards, a community liaison in Mayor Tom Henry’s office and one of Riverpalooza’s organizers. "The younger group was down here (Wednesday) practicing." The six boats used at Riverpalooza came from Dynamic Dragon Boat Racing in Knoxville, Tennessee. According to the company’s website, the boats are 46 feet long and seat 22 people including paddlers, a drummer to provide a beat for the rowers, and a navigator who steers the boat. The number of teams who signed up to participate far exceeded Richards’ expectations. "They told us in training at Knoxville ... if you got 10 or 15 (teams), consider yourself truly blessed," she said. One team of experienced rowers, the Indy Surviveoars, typically doesn’t participate in races that take place in May and often shies away from participating in first-time events. For Riverpalooza, however, the group made an exception. The Indy Surviveoars is made up almost entirely of breast cancer survivors. "We go to four or five races a year. We added this one as an extra race this year once we found out about it, to support the state," said Yopi Havlik, president of the Indy Surviveoars. "We are thrilled to be here and we think that it’s going really, really well." The Indy Surviveoars have been participating in dragon boat races for eight years, Havlik said. Aside from its history in Chinese tradition, dragon boat racing also has strong ties to cancer survivors. Havlik said that about 20 years ago, a Canadian doctor found that participating in dragon boat races helps with lymphedema, a type of swelling that can occur in a patient’s arm after breast cancer surgery. The action of rowing also helps break up scar tissue, she said. In keeping with the races’ history with cancer survivors, the proceeds of Saturday’s events will go to support Cancer Services of Northeast Indiana. The organization also had two boats racing Saturday. "I’m a canoeist, and this is definitely not canoeing," said Lori Schlatter, oncology massage therapist at Cancer Services of Northeast Indiana. "When you’re canoeing, you have a steer person and a front bow person and everyone has a specific job. With (dragon boat racing), you work as a team, as one. It’s fun and it’s crazy." Schlatter said she hopes that next year, Cancer Services of Northeast Indiana can play a larger role in the dragon boat races. "Riverpalooza was great to think of us," said Marsha Haffner, the organization’s director of clinical services. "Cancer Services just has so many friends in the community like that, they just think of us quickly and we’re very fortunate in that way." Haffner said she and the other teams participating are already planning for next year. "People are already talking about it, so I’m hoping it comes back next year," she said.